Are you coming to the National Genealogical Society's annual Family History Conference 13-16 May 2015 in St. Charles, Missouri? 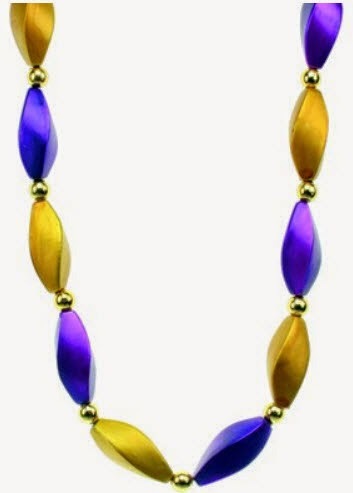 If you are member of GeneaBloggers, have we got beads for you -- blogger beads. You must be an active member of GeneaBloggers attending the conference, and you must register with us here. Please do not use this form if your blog is not listed at GeneaBloggers. (See http://www.geneabloggers.com/genealogy-blogs/ to check listing.) The information you provide will ensure that as a member of GeneaBloggers, you receive the extra-special Blogger Beads which this year are sponsored by DearMYRTLE and Cousin Russ Worthington. Purple & Gold Satin Swirls. Thomas MacEntee first dreamed up "Blogger Beads" as a wacky, colorful way for GeneaBloggers to spot each other in the crowd. Click here to read Thomas' short history of blogger beads. If you would like to become a member of GeneaBloggers, please visit http://www.geneabloggers.com/suggest-blog/. Email Thomas MacEntee at geneabloggers@gmail.com with any questions. You must register with us here. Those who accept blogger-beads could be asked to contribute the costs, and be notified of this ahead of time.